It was Cyrus Day on Saturday and so we had to organise another petition outside the British Mueseum to stop the building of the Sivand dam. Mardavij and Arash had set up a very well organized petition desk. I took a few pictures with my new phone but I am having some difficulty sending them to my computer. So here is a photo from the previous occasions. 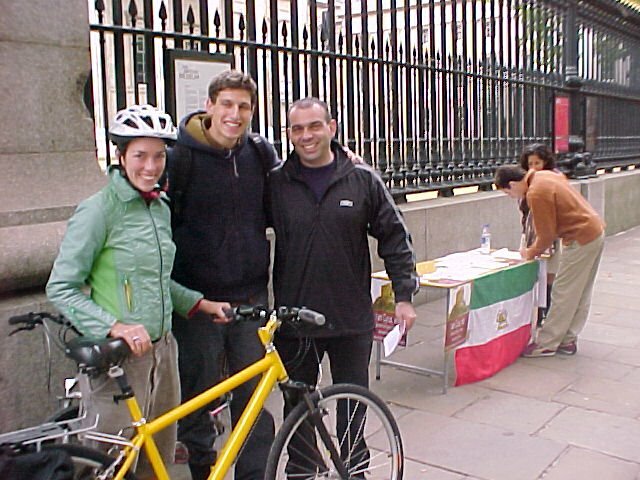 The couple in the photo are the ones who went cycling across Iran and learned to speak Persian fluently in 3 months. Get TechWeb's RSS Feed Copy and paste this RSS feed URL into your news aggregator as a new channel ... If you see an XML icon like this , and you're using Internet Explorer in Windows, you can right-click this button and choose Copy Shortcut to copy the RSS link. georgia highway construction. But luckily there is a site I have found that allows you to buy and sell anything like georgia highway construction on interest free credit and you can pay for your georgia highway construction whenever you want. Here's the link one more time: georgia highway construction.